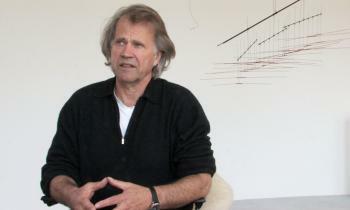 Knopp Ferro, was born on March 30th 1953 in Bensberg near Cologne. From 1973-77 he studied in the Academy for art and design in Cologne. In 1975 he founded the art group "Jet Ferro" which he lead till 1979; besides his artistic practice he co-operated with the circus company Roncalli. From 1980-1990 he worked as author and actor in the performance Project "Bumper to Bumper" in Zurich, organising international Tours with own productions. From 1990-92 Ferro maintained a studio in Zurich, from 1992-94 one in New York, and in 1995 he went to Munich where he lives and works until the moment. Knopp Ferro’s work gets his subjects, rhythms and melodies in the urbanity. His main languages are sculpture and performance. The most used material is iron, with which he expiries, processes and catches his own stories. Knopp Ferro’s work is constituted in a constructivist-minimalist basic structure, combined with a Dadaistic depth. In his performances he combines sound art, installation with surrealistic actions. This Work, Knopp Ferro, by elaa-girona is licensed under a CC BY-NC license.